If you or somebody in your home lives with a disability, there are a number of means of adapting your living space to help make daily life simpler and easier. We explore the funding options that may be available to you and have a look at some simple house adaptations for disabled living that won’t hit you in your pocket. There are many ways to make a home easier to live in depending on your disability, but what works well for one person may not benefit another. There are also several funding streams available depending on your living situation, making it important to do thorough research. You should get in touch with Citizens Advice if you’re unsure, particularly if you live in private rented accommodation. In this blog post, we hope to talk you through the basics when it comes to funding and give you some ideas of how to better set up your home without having to make drastic changes that will cost the earth. Before you look at making adaptations to your home out of your own pocket, you should explore the potential funding options available to you. There are many factors that determine whether or not someone is eligible for financial assistance to adapt a home in order to better meet their needs. The simple fact is that if anyone in your household has difficulty in going about everyday activities around the house — such as showering, cleaning the property or preparing food — you may be eligible for help in adapting your home. If you live in Northern Ireland, you can also apply for a Disabled Facilities Grant, which allows private tenants, landlords and owner occupiers to get assistance in carrying out large or small-scale adaptations. Depending on where you live, you will be eligible for different levels of financial assistance. In England, you may be given up to £30,000; in Wales, you could receive up to £36,000, while in Northern Ireland, you may get up to £25,000. In Scotland, there are no Disabled Facilities Grants available, however, you can look at the gov.scot website for more information on what assistance can be provided. It’s tempting to make drastic changes to your property if you’re looking to adapt the way your home works for you. Often, it seems a no-brainer to make permanent changes right away. 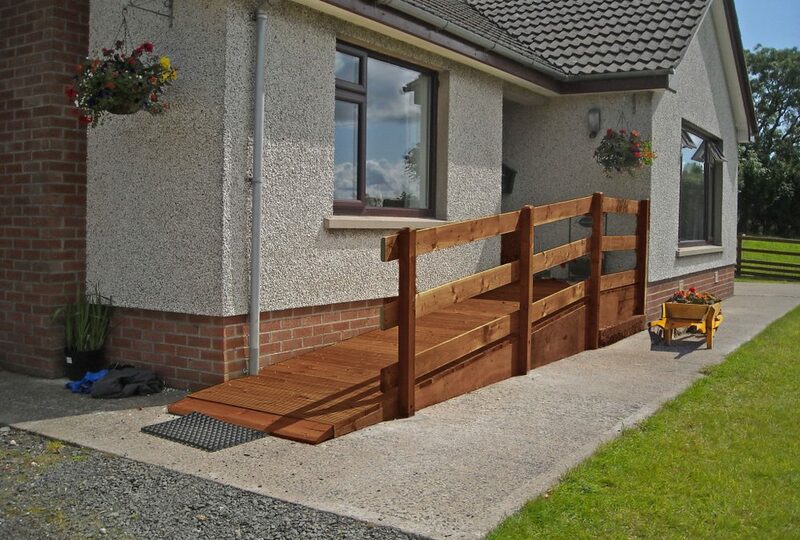 For example, when you’re looking to create a ramp to ease entry and exit to the home, you’ll likely want to get a contractor in to look at changing the approach and facade of your house to better accommodate a wheelchair. However, it may make more sense to go for a semi-permanent solution, particularly if your space is limited and used by many different people. Often, a foldable ramp will do the same job for a smaller upfront cost and will retain the benefit of being removable. Sometimes, the simplest tools can do the most important jobs. Instead of plumbing in a special boiling hot water tap, you could save significant money by using a kettle tipper. This is especially important if you do not believe you will be living at the property for long. The money you save now could be put towards more permanent changes you might want to make when you move into a home that also feels more permanent. There are many occasions where the most basic solution is far more beneficial than the most technologically advanced one. For example, for those who struggle to sit up in bed, there is a multitude of options when it comes to adjustable and electric beds — and you don’t necessarily need to opt for a specialist provider, with solutions available from high-street shops. However, if you are able to use it, a Webbing Jacobs Ladder can help individuals sit up in bed and build core strength. This is a far better and cost-effective solution than having a very expensive bed fitted. Of course, this is not a solution for everybody, but a small investment in such a product will tell you all you need to know. In this case, a positioning aid does not only prove to be an ideal way to save, but it also provides a simple means of building up one’s strength and agility, which is crucial — but can be difficult — for those with limited mobility. Always discuss this with a health professional if you’re unsure. Our final tip is a straightforward one. If you can, get the work done yourself! Alternatively, ask a friend or family member to lend a hand. With simple adaptations like grab rails, you may find it quicker and easier to put them in place yourself, rather than waiting for a contractor. Furthermore, you can put them exactly where you want. Later down the line, you may wish to add smaller handles and rails as you realise where you often reach and require added support. There is a wide variety of sizes and shapes available when it comes to handrails and handles, so doing it yourself could mean that you’re able to fit the perfect set of stability aids in your own home. If you’re having to wait for complex work to be completed in your home, you should also consider the smaller tools that you might benefit from ahead of having everything set up the way you want it to be. A set of reaching tools may be of benefit before you have the locations of important appliances and controls altered for you — and even once these have been altered, these tools can still come in handy, making them a worthy long-term investment. Whatever you decide to do, you should always research what you are entitled to in terms of financial assistance, and make sure you work with a reputable and experienced contractor if you require any large-scale works. Take a look at our wide range of products, including daily living aids and safety rails. Don’t be afraid to get in touch if you have any questions about home adaptation plans or how we can help you find smaller items that complement your plans.